Then God said, “I give you every seed-bearing plant on the face of the whole earth and every tree that has fruit with seed in it. They will be yours for food. And to all the beasts of the earth and all the birds of the air and all the creatures that move on the ground—everything that has the breath of life in it—I give every green plant for food.” And it was so. In looking at the account of the creation of man by God in Genesis 1, we have already seen two points that are emphasized. First, man is created. This is repeated three times in verse 27, obviously for emphasis. Second, man is created in God’s image. This is repeated four times in verses 26 and 27. Following this clue to what are the most important ideas, we come next to the teaching that man was to rule over creation as God’s regent. This is mentioned twice, in verses 26 and 28.
Who is this who is to rule God’s creation? What is he like? What are his gifts? To whom is he responsible? For the purpose of this study I want to follow the substance of an address given by Dr. John H. Gerstner, a former professor of church history at Pittsburgh Theological Seminary, to the Philadelphia Conference on Reformed Theology in 1977. His address considered five things about man as God made him. First, man was created, and he still is. Second, man was created male and female, and he still is. Third, man was created body and soul, and he still is. Fourth, man was created dominant over the animals, and he still is. Fifth, man was created holy, and he still is—not. We have already seen that man’s being created in the image of God involves his having a personality, a sense of morality and spirituality. But in relation to his rule over the animals, to which we have now come, man’s creation involves responsibility as well. If man were his own creator, he would be responsible to no one. But he is not his own creator. He is created by God, and this means that he is responsible to God for what he does in every area of his life and particularly for how he carries out the mandate to rule over creation. These verses record God as saying, “Let us make man in our image, in our likeness, and let them rule over the fish of the sea and the birds of the air, over the livestock, over all the earth, and over all the creatures that move along the ground” (v. 26). To man he says, “Be fruitful and increase in number; fill the earth and subdue it. Rule over the fish of the sea and the birds of the air and over every living creature that moves on the ground” (v. 28). Dominion of any kind, but particularly dominion of this scope, implies responsibility. The biblical view of man could hardly be more different. As Francis Schaeffer correctly notes, “Since God has made man in his own image, man is not caught in the wheels of determinism. Rather man is so great that he can influence history for himself and for others, for this life and the life to come.” Man is fallen. But even in his fallen state he is responsible. He can do great things, or he can do things that are terrible. God created the man and woman and gave them dominion over the created order. Consequently, they were responsible to him for what they did. When man sins, as the Genesis account goes on to show that he does, it is God who requires a reckoning: “Where are you? … Who told you that you were naked? … What is this you have done?” (Gen. 3:9, 11, 13). In the thousands of years since Eden many have convinced themselves that they are not responsible. But the testimony of Scripture is that this area of responsibility still stands and that all will one day answer to God at the judgment. “The dead were judged according to what they had done as recorded in the books” (Rev. 20:12). People are also responsible for their acts toward others. This is the reason for those biblical statements instituting capital punishment as a proper response to murder; for instance, “Whoever sheds the blood of man, by man shall his blood be shed” (Gen. 9:6). These verses are not in the Bible as relics of a more barbarous age or because in the biblical outlook man is not valuable. They are there for precisely the opposite reason: Man is too valuable to be wantonly destroyed. Thus, the harshest penalties are reserved for such destruction. In a related way, James 3:9–10 forbid the use of the tongue to curse others because these others are also made in God’s image: “With the tongue we praise our Lord and Father, and with it we curse men, who have been made in God’s likeness. … This should not be.” In these texts murder of another and cursing of another are forbidden on the grounds that the other person (even after the fall) retains something of God’s image and is therefore to be valued by us, as God also values him. Second, man was created male and female, and it is still so. In our day many say that there are no essential differences between men and women, or that whatever differences there are, are accidental. This is understandable from those who think that mindless evolution is the means by which we have become what we are. But it is entirely incomprehensible from the standpoint of the Bible, which tells us that nothing is an accident and that sexuality in particular is the result of the creative act of God. Maleness and femaleness are therefore good and meaningful, just as other aspects of God’s creation are good and meaningful. Men are not women. Women are not men. One of the saddest things in the universe is a man who tries to be a woman or a woman who tries to be a man. “But who is superior?” someone asks. I answer: A man is absolutely superior to a woman—at being a man; a woman is absolutely superior to a man—at being a woman. But let a woman try to be a man or a man try to be a woman, and you have a monstrosity. This is thought to deny equality before God, as if equality means indistinguishability. But this thought is neither biblical nor rational. The man and the woman are equal before God, but they are not indistinguishable. In the economy of the family (and the church), the man is to lead, protect, care for, cherish, act upon, and initiate. The woman is to respond, receive, be acted upon, bear, nurture, follow. In this the human family is a deliberate parallelism to the Trinity. We say in theology that within the Trinity the three persons are “one God, the same in substance, equal in power and glory.” But there are also distinctions according to which the second person of the Godhead, the Son, voluntarily subordinates himself to carry out the wishes of the Father in redemption, and the third person, the Holy Spirit, voluntarily subordinates himself to the united wills of the Father and Son. Third, God made man body and soul, and he still does. There is a debate at this point between those who believe in a three-part construction of man’s being and those who believe in a two-part construction (the position Gerstner takes in the address I am following). But the debate is not as significant as it sometimes seems. All parties recognize that the human being consists at least of the physical part that dies and needs to be resurrected and the immaterial part that lives beyond death. The only question is whether this immaterial part can be further distinguished as containing, on the one hand, a soul or personality and, on the other hand, a spirit that alone relates us to God. Here the linguistic data should be determinative, but unfortunately it is not as clear as one could wish. Sometimes, particularly in the earlier parts of the Old Testament, soul (nephesh) and spirit (ruach) are used interchangeably. But in other places, particularly in the later parts of the Old Testament, ruach increasingly comes to designate that element by which men and women relate to God, in distinction from nephesh, which then meant merely the life principle. In conformity to this outlook, “soul” is used in reference to animals, while “spirit” is not. Conversely, the prophets, who heard the voice of God and communed with him in a special sense, are always said to be animated by the “spirit” (but not the “soul”) of God. In the New Testament the linguistic data is similar. While soul (psyche) and spirit (pneuma) are sometimes freely exchanged for one another, as in the Old Testament, pneuma nevertheless also expresses that particular capacity for relating to God that is the redeemed man’s glory as opposed to mere psyche, which even the unsaved man possesses (1 Cor. 2:9–16). In this area the particular words are possibly less important than the truths they convey. Those who insist on the unity of man, nevertheless believe that he is more than mere matter. If they adhere to a two-part scheme, they recognize that there is that about him that sets him off from animals. The body is the part we see, the part that possesses physical life. We have a body in common with every living thing. The soul is the part of the person we call personality or self-identity. This is not a simple matter to talk about. The soul is related to the body through the brain, a part of the body. It is also related to the qualities we associate with spirit. Nevertheless, in general terms soul refers to what makes an individual unique. We might say that the soul centers in the mind and includes all likes and dislikes, special abilities or weaknesses, emotions, aspirations, and anything else that makes the individual different from all others of his species. It is because we have souls that we are able to have fellowship, love, and communication with one another. But man does not only have fellowship, love, and communication with others of his species. He also has love and communion with God, and for this he needs a spirit. The spirit is that part of human nature that communes with God and partakes in some measure of God’s essence. God is nowhere said to be body or soul. But God is defined as spirit. “God is spirit,” said Jesus; therefore, “his worshipers must worship in spirit and in truth” (John 4:24). Because man is spirit (or comes to possess a spirit by means of the new birth) he can have fellowship with God and worship him. But we are responsible. The soul does have dominion over the body. Consequently, whatever our weaknesses may be, we are responsible to subordinate our fleshly desires and live for God. Fourth, man was created dominant over the animals—the point particularly stressed in these verses. Martin Luther wrote in his lectures on Genesis that in his opinion Adam in his original state was superior to the animals even in those points where they were strong. “I am fully convinced,” he said, “that before Adam’s sin his eyes were so sharp and clear that they surpassed those of the lynx and eagle. He was stronger than the lions and the bears, whose strength is very great; and he handled them the way we handle puppies.” Later on, as he begins to think of Adam’s intellectual powers, he says, “If … we are looking for an outstanding philosopher, let us not overlook our first parents while they were still free from sin.” It was with such capacities that man ruled creation. At the present time we have this horrible situation. In his sin man either tends to dominate and thus violate the creation, subjecting it to his own selfish ends, or else he tends to fall down and worship the creation, not realizing that his debasement is brought about in the process. As the Bible describes them, the man and the woman were made “a little lower than the heavenly beings” (Ps. 8:5); that is, they were placed between the highest and lowest beings, between angels and beasts. But it is significant that man is described as being slightly lower than the angels rather than being slightly higher than the beasts. That is, man’s privilege is that he is to be a mediating figure, but he is also to be one who looks up rather than down. The unfortunate thing is that when man severs the tie that binds him to God and tries to cast off God’s rule, he does not rise up to take God’s place, as he desires to do, but rather sinks to a more bestial level. In fact, he comes to think of himself as a beast (“the naked ape”) or, even worse, a machine. This brings us to the last point: God created man holy, and now he is—not. The other items we have considered remain, though they are distorted by sin in each case. Man is still a created being, though weak and destined to die. He is still male and female. He is still body and soul. He is still dominant over the animals. But man was also created holy as God is holy, and of this original righteousness not a vestige remains. Rather, as the Scriptures say, “Every inclination of the thoughts of his heart was only evil all the time” (Gen. 6:5). This is why man needs a Savior. God made man upright, but he sought out his own devices. In turning each to his or her own way man brought ruin on the race. Now, not only is no one holy, none is capable even of regaining that holiness. Before the fall, to use Augustine’s phrase, man was posse non peccare (“able not to sin”). But he was also, as Augustine also faithfully declared in accordance with the Bible’s teaching, posse peccare (“able to sin”), which choice he exploited. Now he is non posse non peccare (“not able not to sin”). It is as though he jumped into a pit where he is now trapped. He must remain in that pit until God by grace through the work of Christ and the power of the Holy Spirit lifts him out. 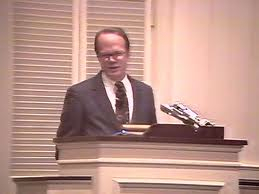 James Montgomery Boice, Th.D., (July 7, 1938 – June 15, 2000) was a Reformed theologian, Bible teacher, and pastor of Tenth Presbyterian Church in Philadelphia from 1968 until his death. He is heard on The Bible Study Hour radio broadcast and was a well-known author and speaker in evangelical and Reformed circles. He also served as Chairman of the International Council on Biblical Inerrancy for over ten years and was a founding member of the Alliance of Confessing Evangelicals. James Boice was one of my favorite Bible teachers. Thankfully – many of his books and expositions of Scripture are still in print and more are becoming available. 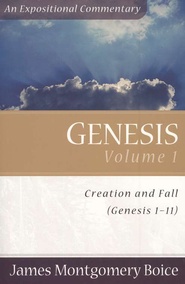 The sermon above was adapted from Chapter 12 in Genesis 1-11: An Expositional Commentary. vol. 1: Creation and Fall. Grand Rapids: Baker, 2006.